SEOUL, Oct. 30 (Yonhap) — The Supreme Court was set to deliver its long-pending ruling Tuesday on damages claims against a Japanese company for unpaid work by four Korean victims of wartime forced labor. The forthcoming full-bench decision by 13 justices, including Chief Justice Kim Meong-su, will affect similar damages suits and the future bilateral relations between South Korea and Japan. Two elderly victims lodged a damages suit with a Japanese court in 1997, each seeking 100 million won (US$87,665) from Nippon Steel & Sumitomo Metal Corp. (NSSM). They lost the suit in 2003 as the highest court in Osaka ruled that the NSSM, a merged entity, is not obliged to take on financial liabilities of its former company. Yeo Woon-taek and Shin Cheon-soo brought the case home and filed fresh suits with two other victims — Kim Kyu-soo and Lee Choon-shik — at Seoul and Busan district courts. The lower courts also turned them down. They filed an appeal at the Supreme Court. In a landmark ruling in May 2012, the South Korean top court quashed the lower courts’ decisions and ordered a retrial in favor of the victims. The court found that the Japanese court’s decision was based on the disputable premise that its 1910-45 colonial rule of Korea was legal, which is contrary to the South Korean Constitution. Tuesday’s ruling comes more than five years after the Japanese company appealed the decision. Another major bone of contention is whether individual rights to compensation are still valid in spite of the 1965 treaty signed between Seoul and Tokyo to settle the colonial-era issues. The Japanese government and firms accused of harsh labor have claimed Japan’s provision of US$500 million to Korea was in exchange for a complete and irreversible settlement. 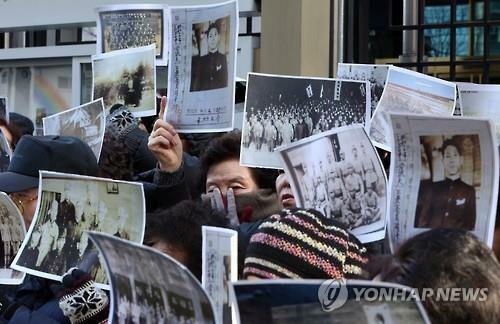 But Seoul has argued the deal does not cover all issues, including Japan’s wartime sexual enslavement of Korean women. The top court in 2012 ruled that the bilateral treaty between states does not terminate individual rights to damages. Recent government data show that the number of survivors dropped 19 percent to 6,570 as of October compared with two years ago. Of the four plaintiffs in Tuesday’s suit, Lee is the only surviving victim.